One mother said she was offered a choice of just two dates which meant her three-year-old had her repeat jabs on the first day of playschool. THE HSE HAS been criticised for how it handled a vaccination error that meant over 200 children needed to have their jabs administered a second time. One concerned mother told TheJournal.ie that the HSE helpline she and her husband were told to call “weren’t very helpful at all” and they were only given a choice of two dates for their three-year-old to get her vaccination for the second time. Letters were sent to parents earlier this month to inform them that vaccinations given to their children by one GP may not have been effective due to an error in the way they were administered. It is understood that the GP in question is Dr Derek Graham in Newcastle, west Dublin. Michelle O’Leary said she and her husband had been attending the GP’s surgery themselves for several years before they had their first child and they brought their daughter there for her vaccinations as a baby. Children were given a mix of vaccinations in one injection instead of separate jabs and O’Leary said she “never thought anything of it”. The mother of two said her main concern was about the potential side effects of giving a child two doses of vaccinations. “You hear all these horror stories about the negative aspects of giving children vaccinations and even though the first ones might not have been effective that’s still a double dose she’s getting,” she said. When O’Leary called the HSE helpline to ask about research on this subject she was told a doctor would call her back but yesterday she said she was still waiting for that call. Her two-year-old son also received two vaccinations mixed in the one injection by the same doctor but received his third elsewhere and the HSE has yet to contact her about his repeat jabs. “The letter was only for my daughter because she got all three from that GP and my son only got the first two there but they were done in the same way and when I asked them about it they just said they’ll be in touch,” she said. O’Leary was given a choice of just two dates but will be away on one of them so her three-year-old had to go straight to a HSE clinic for her repeat jab yesterday after her first day in playschool. A HSE spokesperson confirmed just two dates were offered to parents for repeat vaccinations but said it will “see how things progress”. Responding to O’Leary’s comments about not receiving a letter about her other child the spokesperson said all letters had been sent out and “the HSE can’t comment on individual cases”. Email “HSE criticised for management of child vaccinations error”. 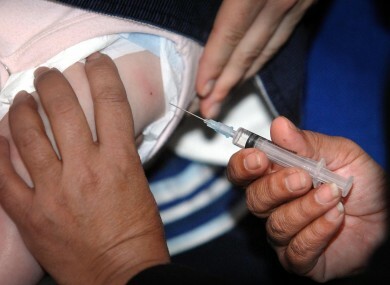 Feedback on “HSE criticised for management of child vaccinations error”.